Manchester City moved 16 points clear at the top of the Premier league table with a convincing 5-1 win at home to Leicester City as second placed Manchester United fell 1-0 away to struggling Newcastle United. The battle for top four gets tighter by the day as Tottenham triumphed over North London rivals Arsenal and Liverpool produced a stunning first half performance to win 2-0 at Southampton. At the bottom, Huddersfield Town and Swansea City moved away from the relegation zone with respective home wins while West Brom who play Chelsea on Monday are now seven points adrift of Safety. Here are the 11 players that stood out over the weekend as per Shaban Lubega, PML Daily sports correspondent. GK. Mat Ryan(Brighton and Hove Albion). Brighton who have been struggling at home all season picked up a vital point away to Stock City on Saturday and it was all down to their Australian shot stopper Mat Ryan. When the Seagulls conceded a penalty in the 90th minute, it was like reality had finally set in on a ground they have never won a game and where set to loose for a sixth consecutive time at Stock City but Ryan who has played every minute of their return to the top tier had other ideas. He saved the resulting kick from Charlie Adams propelling his side to move two points away from the relegation zone. One of the most consistent performers for the Magpies this season, Paul Dummet had one of his best performances of his career against Manchester United on Sunday. The Welshman defended like it was his last game and on a few occasions tried to push the team forward and produced two brilliant crosses which where not met by his team’s forwards. He may be blamed for letting Anthony Martial in on goal late in the first half but who cares after his goal keeper bailed him out with a stunning low save. 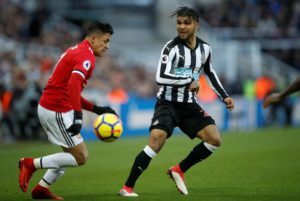 The key pillar in Newcastle’s defence once again stood out against Man United as he made several key blocks and interceptions on route to a vital three points for his side. Lescalles made a brilliant block after Sanchez was through on goal and his leadership skills where evidently one of the attributes that stood out in his side’s victory. Newcastle United’s captain Jamal Lascalles was a rock at the back against Manchester United. Vertongen seems to have finally coped with the absence of his defensive partner Toby Alderwierld and against Arsenal, the tall Belgian ran the show with a defensive master class. Despite Arsenal crafting a few chances later on, Vertongen was always key to the team’s organisation at the back and his long accurate balls could nearly have led to Tottenham doubling their advantage had the forwards been a little bit more sharper. The chief architect in Tottenham’s dominance of the North London derby on Saturday. The strong Belgian dictated the tempo and barely put a foot wrong of the game as no Arsenal midfielder could even get close to him. Such performances will be vital to Spurs in the next few months as they struggle to make it to the top four and go as far as they can in the UEFA Champions league. 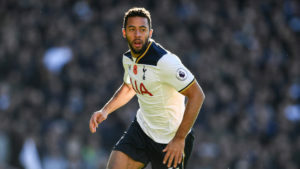 Mousa Dembele stood out on Saturday against Arsenal. MF. Jonjo Shelvy (Newcastle United). When you boss a midfield consisting of Nimanja Matic and Paul Pogba, one will have to wounder how in the world you did it. That is exactly what the Englishman did over the weekend with superbly timed challenges and the free kick that resulted into the solitary goal at the St. James park. He may still be miles away from the boy who wowed crowds at Swansea but surely that was one hell of a performance against a top side with top players. MF. Kevin De Bryne(Manchester City). 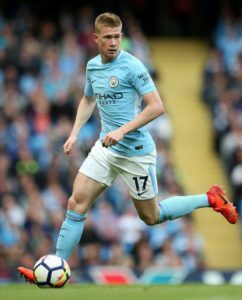 What a perfomance against Leicester City on Saturday evening, the Belgian midfield maestro made a hat tirck of assists to cap one of his best perfomanaces in a Citizens shirt. Already the lots’ player of the season and we can all be sure the best is still yet to come from the Chelsea reject. MF. Marko Arnautovic (West Ham United). All players want to be liked, and Marko Arnautovic is no different. Fans tend not to like Arnautovic because he has the ability to embarrass the opposition. Arnautovic is moody, unpredictable, passionate and exciting all at the same time. Some of that we witnessed against Watford, and to top it all he can, on any given day, cause the opposition great embarrassment. Ask former Stoke boss Mark Hughes. FW. Roberto Firmino (Liverpool) . What a pass for Muhammad Salah to make it 2-0. 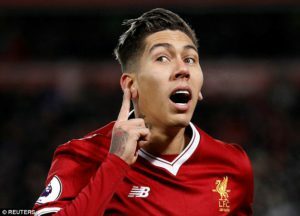 Roberto Firmino has slowly but steadily turned into the false nine that Jurgen Klopp has always craved for in his ‘Gegen’ pressing style of play. Scored his 12 goal in the league this season against Southampton and surely this is turning out to be his best ever season in England. Roberto Firmino scored and assisted against Southampton on Sunday. FW. Tomas Munier (Huddersfield Town). The former Lorient forward took the initiative against Bournemouth last Saturday and produced the performance that his side expected of him when they made him their highest transfer purchase last summer. The assist to Alex Pritchard for the opener after only seven minutes was a glimpse of the day that lay ahead as the Beninese striker also got on to the score sheet mid-way through the first half for his side to regain their lead that they never surrendered again. FW. Sergio Arguero (Manchester City). Four goals against Leicester City will go down as one of his better performances in front of goal but not his best as he has already hit five in one game against Newcastle United a few seasons ago. He has been arguably the most consistent performer in the league over the last five years and still yet to win the player of the season, how does someone explain that? Rafa Benitez mastermind a splendid performance on a day that his side badly needed it and against a top side. Newcastle started the game in the relegation zone and Benitez, more than anyone else, knew how much his side needed the win. He organised his charges brilliantly and got his wish against a Manchester United side that claim that they are still in the running for the league crown. 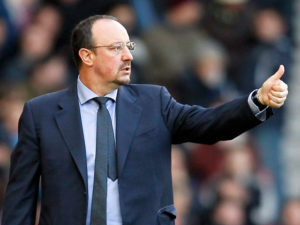 Rafael Benitez masterminded the 1-0 win over United on Sunday.